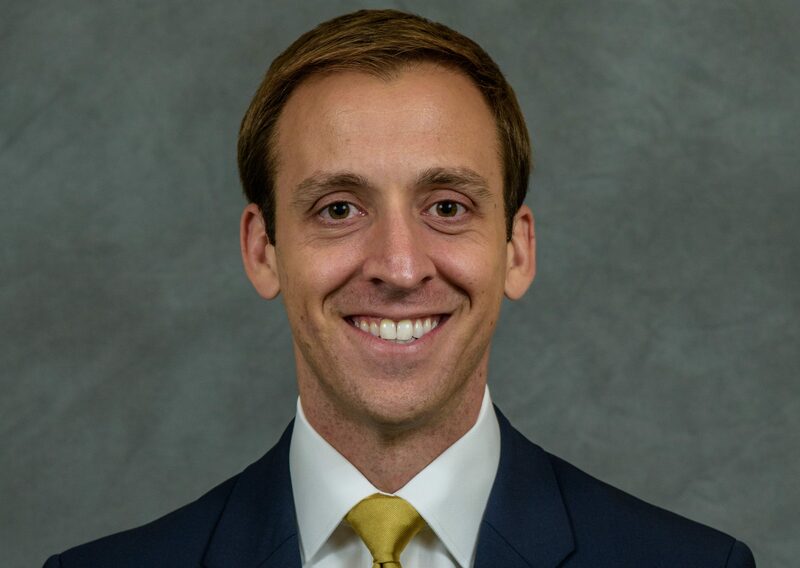 Butler graduate Brandon Gaudin is the play-by-play voice for the Madden NFL video game series. Photo courtesy of Wikimedia Commons. Brandon Gaudin’s voice increased in enthusiasm up as he began to describe the day he got the call. Gaudin ‘06 is not talking about when he was featured for the first time on SportsCenter. He’s not talking about when he was profiled in the New York Times or USA Today. He’s not talking about when he earned CBS play-by-play announcer of the year, crowned by legendary announcer Greg Gumbel. Yes, he has earned all these things, but on this particular day walking into that particular gym, Gaudin is talking about the moment he learned he would be the new play-by-play announcer of the Madden video game franchise. Gaudin was already a rising star in the sportscasting industry. As the Bulldogs’ play-by-play voice for three seasons, he was on the call for Butler’s miracle trip to the 2011 Final Four. He then became the voice of the Georgia Tech Yellow Jackets. What made this hire so special was that not only would Gaudin be replacing a living legend in Wes Durham, but Gaudin also won this position before his 30th birthday. As a young face in an aging profession, Brandon was making waves. In 2015, while he was still working at Georgia Tech, Gaudin got an offer to audition for Madden’s commentary vacancy. Gaudin then began a long and laborious process of the audition. He traveled back and forth four times from Georgia Tech to Orlando. “People must’ve thought I had a secret girlfriend in Orlando,” Gaudin joked. His nondisclosure agreement forced him to remain mum on the reason for his trips. He auditioned with four different color analysts, recording sample lines and practicing mock games so EA Sports could get a feel for their talents. Finally, in July 2015, EA told Brandon he would be the new play-by-play man for Madden. Gaudin would be replacing Jim Nantz, a titan in the industry. In a profession built on people “waiting their turn,” Gaudin achieved more before turning 30 than most will achieve in the entirety of their careers. Gaudin would star alongside Charles Davis, a former standout defensive back for the Tennessee Volunteers. Together, the team works to create a realistic sounding broadcasting booth for the newest games that Madden has to offer. If you’re playing Madden and have the ball with two minutes to go down, expect Gaudin to ask Davis about the trials of crunch time, and Davis will tell a story from his playing days while adding to the explanation of the scene being played out on the virtual field below. How in the world does that work? Meet Ed Brady, lead audio and commentary designer at EA Sports. Brady is the mind behind the Madden commentary. He oversees the writing of the scripts, the recording, the engineering into the game; he is the top man behind the glass. With a game like football, there are quite a few scenarios and situations that could happen. Managing which line to use at a given time is up to Brady and the other engineers at EA Sports. To make their jobs manageable, the team has created a set of complex algorithms. The game’s algorithm goes through situation by situation, trying to figure out the most important thing that a certain event is attached to, and that line of dialogue is the one that wins out. All three men are equally important to the process of thinking up and creating the lines. Sometimes it is Brady that comes to them with a script, but other times, it is simply up to the whim of Davis or Gaudin to add their own off-the-cuff thoughts. “Ed is very good about us ad-libbing,” Davis said. He also said that he draws on things from all aspects of his life, from his days as a player to his days as a commentator and even his days as a fan, just like all of us. “I use things I remember thinking about from when I was five or six years old,” Davis said. He also sees the importance of Madden in the NFL community. “Every week [in our player meetings], somebody says something that connects to the Madden franchise. I hear a reference to it every single week,” Davis said. He recalled a specific time when legendary former Chargers running back LaDainian Tomlinson approached him about the game, knowing that Davis was on the commentary team. The process of creating the game and its audio content is anything but easy. Gaudin takes about 35 to 40 trips to EA’s studio in Orlando each year to work on both updating content for the current game and recording new content for the next installment. “Delta Airlines and a rollaway suitcase are my two best friends,” he joked. Yet, he described the experience glowingly when all is said and done. So, the next time you pop in the disk for Madden 19 and hear the all too familiar “EA Sports. It’s in the game,” and you get a big first down on a circus catch that came just in time to beat your friend sitting across the couch, listen into the commentary. Listen to the detail, the precision, and the accuracy of two men spouting their love of the game. Think not only about the two commentators sitting in the virtual studio, but also of the hundreds of men and women like Brady who do so much to make the game we love possible.